With the election over, the conventional thinking says that it’s going to be smooth sailing for stocks. The uncertainty hovering over the market has been removed as fast as the political signs from your neighbors’ front yard. But 2018 has been a rough year for some of the benchmarks in the Dow Jones Index, and the correction that overtook the market in October put these stocks in a hole that they have yet to completely climb out. Some of these companies present a good buying opportunity as investors look to 2019. Others may have some questions that they still have to answer. Maybe they’ll make a recovery in the short term. But maybe they won’t. Do you buy, sell, or hold? In this slideshow, we look at seven stocks in the Dow Jones Index that are lagging behind the market in 2018. They may be a question of good stocks in a bad situation, or it may be an indication of something more serious. Either way, you should look at each of these stocks carefully to decide if they should be part of your portfolio. Caterpillar, Inc. (NYSE: CAT) Many analysts seem to be viewing Caterpillar as a stock that represents a great buying opportunity. Recently 27 analysts gave guidance that suggested that Caterpillar’s stock could rise up to 30% above its October low. The stock was battered in October reporting a -20.4% return in that period, bringing its return for the year down to a -14.3%. Like 3M, Caterpillar is facing some challenges in near-term earnings periods as a stronger dollar, increased freight costs, and potential tariff issues will continue to weigh on the sector. However, the larger issue for Caterpillar seems like a case of managing expectations – or trying to determine what reasonable expectations should be. Their latest earnings report showed strong gains in both revenue and earnings per share, but the results weren’t as strong as expected. This reflected softening demand in Asia, and in particular China. Those fears were not unfounded as China’s economy reported its weakest third quarter since the Great Recession. However, the question has to be asked if Caterpillar is an example of a good stock that was the victim of an overreaction. The company is forecasting positive earnings guidance for the fourth quarter, including accelerated growth from China. Like many companies, there would be a lot more clarity about Caterpillar were the noise about trade and tariffs to subside. Caterpillar Inc. manufactures and sells construction and mining equipment, diesel and natural gas engines, and industrial gas turbines. Its Construction Industries segment offers asphalt pavers, compactors, cold planers, feller bunchers, harvesters, motorgraders, pipelayers, road reclaimers, skidders, telehandlers, and utility vehicles; backhoe, knuckleboom, compact track, multi-terrain, skid steer, and track-type loaders; forestry and wheel excavators; and site prep and track-type tractors. The company's Resource Industries segment provides electric rope and hydraulic shovels, draglines, rotary drills, hard rock vehicles, track-type tractors, mining trucks, longwall miners, wheel loaders, off-highway and articulated trucks, wheel tractor scrapers, wheel dozers, landfill and soil compactors, machinery components, electronics and control systems, select work tools, and hard rock continuous mining systems. Its Energy & Transportation segment offers reciprocating engine powered generator sets; reciprocating engines and integrated systems for the power generation, marine, oil, and gas industries; turbines, centrifugal gas compressors, and related services; remanufactured reciprocating engines and components; and diesel-electric locomotives and components, and other rail-related products. The company's Financial Products segment provides operating and finance leases, installment sale contracts, working capital loans, and wholesale financing; and insurance and risk management products. Its All Other operating segment manufactures filters and fluids, undercarriage, ground engaging tools, fluid transfer products, precision seals, and rubber sealing and connecting components; parts distribution; integrated logistics solutions and distribution services; and digital investments services. The company was formerly known as Caterpillar Tractor Co. and changed its name to Caterpillar Inc. in 1986. The company was founded in 1925 and is headquartered in Deerfield, Illinois. Ratings Breakdown: 13 Buy Ratings, 12 Hold Ratings, 2 Sell Ratings. IBM (NYSE: IBM) IBM has had one of the roughest years among the Dow Jones components. The stock is down 18.6% for the year after a brutal 23.7% decline in October. In the summer, Warren Buffet sold a third of his shares in the company after it reported weaker than expected operating margins which led some analysts to question whether IBM would be able to meet their forecasted annual earnings. IBM has been conspicuously transitioning their business model from a hardware company to a business focused on software and analytics. It appears that for now, the transition is working. In early November, Ancestry along with several European startups announced plans to work with IBM's Cloud services for their artificial intelligence (AI), blockchain and Internet of Things (IoT) technologies. However, despite this good news, investors are seeing history repeating itself as IBM recently paid a high premium to buy out Red Hat which dilutes the value of their brand. The stock was already trading at a discount to a fair market value before the Red Hat announcement, but with the stock currently in dead last among the Dow 30 components, investors seem to be signaling that IBM may have some fences to mend before investors go all in with the stock. Ratings Breakdown: 7 Buy Ratings, 10 Hold Ratings, 2 Sell Ratings. 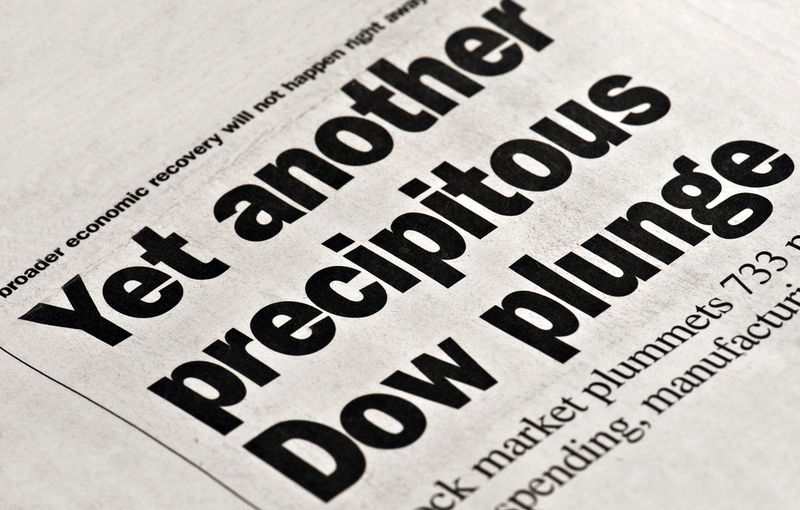 Dow DuPont (NYSE: DWDP) Company mergers are notoriously tricky. And they generally don’t bode well for a company’s stock. Such is the case of Dow DuPont. The company’s stock price has had, to put it simply, a terrible year. After falling 16.2% in October, the stock was down 24% for 2018. Only IBM’s stock was ranked lower among the Dow Jones components. This is year two of the merger between the former chemical giants. The problem of the moment is that their long-term plan is incredibly complex and right now is hard for investors to get their mind around. According to the company, by the middle of 2019 current shareholders will own shares of three publicly traded companies which would include the Dow and DuPont names and add a farm-focused unit called Corteva Agriscience. While that sounds good, their current agricultural unit, which was one of their primary sources of growth, is suffering from lower sales, tighter margins, and unfavorable exchange rates. Since the start of November, shares are up 9% but still lag behind the S&P 500. DowDuPont Inc., through its subsidiaries, engages in agriculture, materials science, and specialty products businesses in the United States, Canada, the Asia Pacific, Latin America, Europe, the Middle East, and Africa. The company's Agriculture segment produces, and sells hybrid corn seed and soybean seed varieties; sunflowers, wheat, alfalfa, canola, cotton, rice, and sorghum; silage inoculants; and crop protection products that include weed control, disease control, and insect control. Its Performance Materials & Coatings segment manufactures and sells architectural paints and coatings, and industrial coatings; performance monomers and silicones; standalone silicones; and home and personal care solutions. The company's Industrial Intermediates & Infrastructure segment offers ethylene oxides, propylene oxide derivatives, cellulose ethers, redispersible latex powders, and acrylic emulsions; sustainable solutions; and chlorine and caustic soda. Its Packaging & Specialty Plastics segment provides ethylene, and propylene and aromatic products; and polyolefin elastomers and ethylene propylene diene monomer rubbers. The company's Electronics & Imaging segment offers materials and systems for mobile devices, television monitors, personal computers, and electronics. Its Nutrition & Biosciences segment provides specialty ingredients, as well as cellulosic- and alginates-based pharma excipients; and enzymes, biomaterials, biocides, and antimicrobial solutions and process technologies. The company's Transportation & Advanced Polymers segment offers engineering resins, adhesives, lubricants, and parts for transportation, electronics, healthcare, industrial, and consumer end-markets. Its Safety & Construction segment provides engineered products and integrated systems for construction, worker safety, energy, oil and gas, transportation, medical device, and water purification and separation industries. The company was founded in 1897 and is headquartered in Midland, Michigan. Ratings Breakdown: 9 Buy Ratings, 11 Hold Ratings, 0 Sell Ratings. Home Depot (NYSE: HD) As was the case with many stocks, October was a cruel month for Home Depot’s stock. The stock suffered a 15.1% decline which put the stock in the red for the year with a -1.2% return. One of the reasons for the decline in October focused on concerns about a slowing U.S. housing market. However at least one stock analysis firm, Gordon Haskett Research Advisors, prefers Home Depot’s stock to competitors such as Lowe’s and RH because they say HD is “investing offensively and better positioned to navigate a potentially choppy backdrop”. The reality is that Home Depot's stock may be undervalued and present a great buying opportunity for investors. The stock is currently trading at around 18X forward EPS estimates which are significantly down from the industry average of 25.7X forward EPS. And while the 18X number is slightly higher than Lowe's, it is less than its five-year median of 19X. Another positive sign for the stock is that it is expected to report favorable financial results for the third quarter. The Home Depot, Inc. operates as a home improvement retailer. It operates The Home Depot stores that sell various building materials, home improvement products, lawn and garden products, and décor products, as well as provide installation, home maintenance, and professional service programs to do-it-yourself and professional customers. The company also offers installation programs that include flooring, cabinets and cabinet makeovers, countertops, furnaces and central air systems, and windows; and professional installation in various categories sold through its stores and in-home sales programs, as well as acts as a contractor to provide installation services to its do-it-for-me customers through third-party installers. In addition, it provides tool and equipment rental services. The company primarily serves home owners; and professional renovators/remodelers, general contractors, handymen, property managers, building service contractors, and specialty tradesmen, such as electricians, plumbers, and painters. It also sells its products online. As of February 3, 2019, the company operated 2,287 stores in the United States, including the Commonwealth of Puerto Rico, and the territories of the U.S. Virgin Islands and Guam; Canada; and Mexico. The Home Depot, Inc. was founded in 1978 and is based in Atlanta, Georgia. Ratings Breakdown: 11 Buy Ratings, 7 Hold Ratings, 0 Sell Ratings. Chevron Corp. (NYSE: CVX) You don’t have to look very far to see why Chevron’s stock may be falling. Oil prices have been noticeably falling. While this is good for consumers at the gas pump, it can be troublesome for the oil and gas companies that rely on higher oil prices to provide a positive return on their company’s investments. Chevron’s stock dropped 8.7% in October to put it at -3.5% for 2018. The good news for investors is that Chevron is expected to report positive earnings when they issue their next earnings report in February of 2019. They are expected to report an EPS of $2.56, which would mark a nearly 250% year-over-year increase. Revenue is also expected to come in higher at $44.79 billion, which would be a nearly 20% increase from the previous quarter. However, recent reports are citing that Chevron is considering pulling out of their joint venture in Venezuela, a country where Chevron remains the last major U.S. oil company. Meanwhile, the industry as a whole is facing headwinds, and some analysts are projecting oil prices to stay in a tight range at levels not too far above their current level. The best course of action for investors at this point may be to stay on the sidelines until the near-term outlook for oil prices becomes clearer. Chevron Corporation, through its subsidiaries, engages in integrated energy, chemicals, and petroleum operations worldwide. The company operates in two segments, Upstream and Downstream. The Upstream segment is involved in the exploration, development, and production of crude oil and natural gas; processing, liquefaction, transportation, and regasification associated with liquefied natural gas; transportation of crude oil through pipelines; and transportation, storage, and marketing of natural gas, as well as operates a gas-to-liquids plant. The Downstream segment engages in refining crude oil into petroleum products; marketing crude oil and refined products; transporting crude oil and refined products through pipeline, marine vessel, motor equipment, and rail car; and manufacturing and marketing commodity petrochemicals, and fuel and lubricant additives, as well as plastics for industrial uses. It is also involved in the cash management and debt financing activities; insurance operations; real estate activities; and technology businesses. The company was formerly known as ChevronTexaco Corporation and changed its name to Chevron Corporation in 2005. Chevron Corporation was founded in 1879 and is headquartered in San Ramon, California. Ratings Breakdown: 14 Buy Ratings, 5 Hold Ratings, 0 Sell Ratings. 3M Company (NYSE: MMM) 3M is a company that is going against the grain. Where the trend for most companies is to consolidate their business units to focus on their core competencies and/or the areas where they are most profitable, 3M is broadening their product base. However, their stock has been taking a beating in 2018. In the month of October, a month that was brutal for many stocks, MMM suffered a decline of 9.7%. This brought their year-to-date performance to a -14.5%. 3M has tended to sell products that can command a premium price which has allowed them, in good times, to show investors growth in revenue and earnings per share (EPS). That hasn’t been the case lately. In their most recent earnings report, issued in early October, the company missed on both their revenue and earnings per share estimates. Their stock subsequently took a hit. And although 3M is a Dividend King, having delivered 60 years of dividend growth, investors have to ask whether that is reason enough to own the stock. The industrial sector faces continued uncertainty by the ongoing trade dispute with China, the threat of inflation which is being manifest in a strengthening U.S. dollar. For investors who had 3M in their portfolio before the stock tumbled, now might be the time to hang on tight and hope for a bit of a recovery before considering selling, but investors should exercise caution before viewing the stock as a buying opportunity. 3M Company operates as a technology company worldwide. The company's Industrial segment offers tapes, abrasives, adhesives, ceramics, sealants, specialty materials, purification products, closure systems, acoustic systems products, automotive components, abrasion-resistant films, and paint finishing and detailing products. Its Safety and Graphics segment provides personal protection and transportation safety products, commercial graphics systems, commercial cleaning and protection products, floor matting, roofing granules, fall protection products, self-contained breathing apparatus systems, and gas and flame detection instruments. The company's Health Care segment offers medical and surgical supplies, skin health and infection prevention products, drug delivery and health information systems, dental and orthodontic products, and food safety products. Its Electronics and Energy segment provides optical films, packaging and interconnection devices, insulating and splicing solutions, touch screens and monitors, renewable energy component solutions, and infrastructure protection products. The company's Consumer segment offers consumer and office tapes and adhesives, repositionable notes, indexing systems, home improvement products, furnace filters, painter tapes, mounting and home care products, sponges, scouring pads, high-performance clothes, protective material products, and adhesive bandages and braces. It also provides cloud-based, conversational artificial intelligence-powered systems. It serves automotive, electronics and automotive electrification, appliance, paper and printing, packaging, food and beverage, construction, medical clinics and hospitals, pharmaceuticals, dental and orthodontic practitioners, health information systems, food manufacturing and testing, consumer and office retail, office business to business, home improvement, drug and pharmacy retail, and other markets. The company was founded in 1902 and is headquartered in St. Paul, Minnesota. Ratings Breakdown: 5 Buy Ratings, 5 Hold Ratings, 2 Sell Ratings. Exxon Mobil (NYSE: XOM) Exxon Mobil is another oil and gas stock that saw a stiff decline in their stock price during the month of October. The stock plummeted 6.3% which put it into the red at -0.7% for 2018. XOM recently reported positive earnings for the third quarter, but questions remain as to whether the recent positive earnings trends will continue. On November 8, oil officially entered into a bear market territory, and that tends to reflect negatively on the stock prices of major energy providers. However, there are some fundamental concerns about Exxon Mobil’s stock that are making investors nervous. One is falling production. When an oil company is seeing a decline in production, it means their business is shrinking. The company saw a 2.7% decline in 2016 and 2017. By itself, this wasn’t too concerning for investors, but production declines have continued into 2018 when oil was surging. And in their Q2 earnings call, Exxon essentially told their shareholders that they were focusing on long-term plans, which meant that in the short-term, their growth may continue to decline. Another fundamental trend that is working against the stock is that Exxon’s return on invested capital has moved from being among the best in its sector to somewhere in the middle of the road. Once again, Exxon is staying committing to their long-term plans, but it remains to be seen if that approach will pacify investors. Exxon Mobil Corporation explores for and produces crude oil and natural gas in the United States, Canada/Other Americas, Europe, Africa, Asia, and Australia/Oceania. It operates through Upstream, Downstream, and Chemical segments. The company is also involved in the manufacture, trade, transport, and sale of crude oil, petroleum products, and other specialty products; and manufactures and markets petrochemicals, including olefins, polyolefins, aromatics, and various other petrochemicals. As of December 31, 2018, it had approximately 24,696 net operated wells with proved reserves of 24.3 billion oil-equivalent barrels. The company was founded in 1870 and is headquartered in Irving, Texas. Ratings Breakdown: 8 Buy Ratings, 12 Hold Ratings, 3 Sell Ratings. 2018 has been a good year for many stocks that are part of the Dow Jones Industrial Index. So when a company is lagging behind the index, investors notice. The seven stocks in this report are all, at this writing, trading in the red for 2018. For some of these stocks, their descent into negative territory was due to the October correction. However, each of these stocks has one or more issues that are weighing on investors' minds. Whether it trades in a sector that looks to be reversing, in the process of a messy merger, or perhaps waiting on long-term plans to materialize, these seven stocks are not a clear buy as we enter 2019. If you’re an investor looking for a one-stop source for keeping on top of news affecting the stocks in your portfolio or on your watch list, now is the perfect time to invest in MarketBeat All Access which gives you real-time analyst ratings, earnings, dividends, and a host of other investment research tools.